`This paper described the precise guide-block system equipped with a Kawai-type multi-anvil press SPEED-Mk.II in the synchrotron radiation facility SPring-8, which is later equipped with IRIS-15 in the BGI. 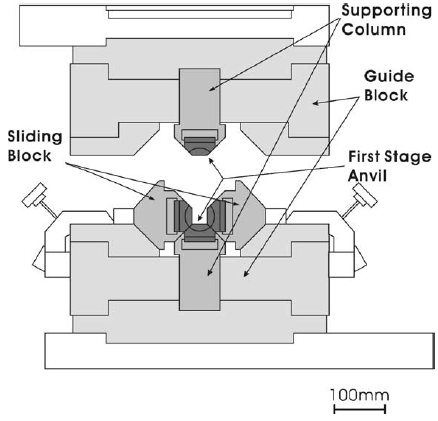 This guide block system keeps the vertical and horizontal dimensions of the cubic compressional space made by the first-stage anvils within 60 µm over the whole range of press load, which prevents breakage of anvils and especially blow-out. Fig. 1. Schematic drawing of the high-pressure vessel. The columns that support the upper and lower first-stage anvils (supporting columns) are separated from the main parts of the guide blocks so that the change of the relative dimension of the cubic compression space with press load can be minimized through adjustment.